The "Fearless Girl" statue near Wall Street that has become a global symbol of female can-do business spirit will be moved from her spot facing the "Charging Bull" to a location by the New York Stock Exchange. Ray Villeda reports. The "Fearless Girl" is on the move. The statue that inspired millions with her message of female empowerment has been plucked from her spot opposite Wall Street's "Charging Bull" and will be reinstalled in front of the New York Stock Exchange by the end of the year, officials said Wednesday. 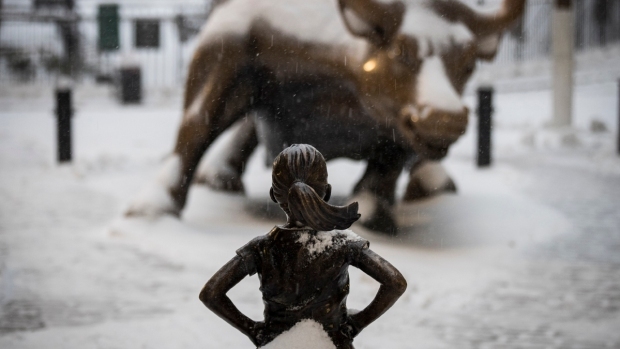 The Boston-based financial services firm State Street Global Advisors said the sculpture of a defiant-looking young girl was moved Tuesday night. No date for her reinstallation at the stock exchange was given. 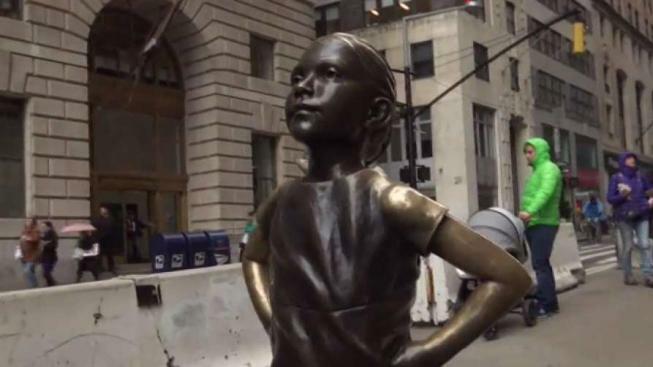 Artist Arturo Di Modica is accusing the City of New York of violating his legal rights by allowing artist Kristen Visbal's statue of the "Fearless Girl" installed in front of his own sculpture, "Charging Bull," without his permission. He calls Visbal's installation an "advertising trick." A plaque with two footsteps marks the girl's former spot on a traffic island near the tip of Manhattan. "Fearless Girl is on the move to The New York Stock Exchange," the plaque reads. "Until she's there, stand for her." The hands-on-hips bronze statue was intended as a temporary display when State Street installed it in March 2017 to encourage corporations to put more women on their boards. City officials extended her stay after she became a favorite with tourists, who lined up for selfies with the 4-foot (130-centimeter) bronze celebrity. One person who was not a fan of the statue was Arturo Di Modica, the artist who created "Charging Bull" and installed it in lower Manhattan in 1989 without permission. Di Modica complained that his 11-foot-tall bull was meant to embody "strength, power and love," but having "Fearless Girl" face off against his work had turned the bull's message into something negative. A bronze statue of a young girl showed up near the iconic charging bull statue on Wall Street ahead of the International Women's Day. "The girl is right in front doing this, 'Now I'm here, what are you going to do?'" Di Modica said last year. City officials, meanwhile, announced in April 2018 they would move both statues about three blocks away to the stock exchange because the crowds of pedestrians clustered around the statues presented a traffic hazard. A spokeswoman for Democratic Mayor Bill de Blasio said details on when the 11-foot-tall (3-meter-tall) bull would be moved and where exactly it would be placed were not available. An attorney for Di Modica did not immediately return a call seeking comment on the bull's potential relocation. "Fearless Girl" sculptor Kristen Visbal did not immediately return a call seeking comment on her statue's move.